…. and then June — because Beyoncé ran the entire month of April. She launched Ivy Park on April 14, premiered the visual album Lemonade on April 23 and kicked off the Formation World Tour on April 27 (it ended up averaging $5.2 million in gross per show). For the rest of us, the process went something like this: Your life was snatched by Bey au naturel on the cover of Elle, and you bumped the Lemonade album on her husband’s Tidal (the only place you could find it) while getting dressed in Ivy Park gear to head out to see Queen Bey on her tour. This was life, all of summer ’16. The Elle shoot started at the crack of dawn in a Los Angeles dance studio. “We were told 5 [a.m.],” said Samira Nasr, Elle fashion director and stylist on the shoot. “It wasn’t even 5:01, and [Beyoncé] was on set. 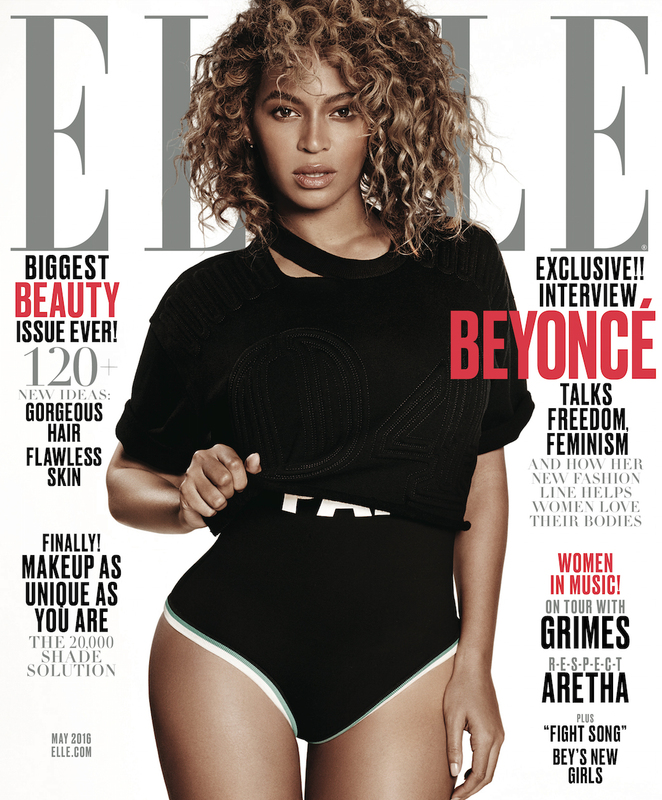 She’s an absolute professional: kind, courteous.” Beyoncé’s team collaborated with Elle to produce a cover that would usher in the revitalization of being an authentically natural girl. Kimble applied leave-in conditioner and a dab of gel to Yoncé’s tresses as she allowed them to air-dry and then styled the soft curls with a curling iron. Makeup artist Sir John dusted Bey’s face with a no-makeup makeup look. Ivy Park was the focus of the shoot, so the styling was straightforwardly athletic. Cue the famous “Beyoncé wind.” The cover ushered in perhaps Beyoncé’s most honest message to fans: one of self-love and self-care. Fresh off the release of her 2008 Sasha Fierce, Beyoncé graced the January 2009 cover of Elle wearing bone straight long hair, also styled by Kimble. Now, no longer in need of a “Fierce” persona, Beyoncé encouraged women to find their own “park,” away from the beauty standards and fashion trends, and simply be their best selves. As talented as Beyoncé is, not everything comes easy. Her first venture into the fashion world, House of Deréon, never took off in the mainstream. Shortly after the launch of Ivy Park, Beyoncé was awarded the Fashion Icon of the Year award by the Council of Fashion Designers of America (CFDA). With a new fashion venture named after her daughter (Deréon was her grandmother’s surname), Beyoncé created her own fashion business redemption. In a world where there is a fashion trend for pretty much anything — work, the gym, a night out — Beyoncé gave us the anti-trend. It isn’t tied to any one physical activity. Not yoga, the gym, or even dance. Ivy Park’s pieces fall off your shoulders and sway as you move, doing whatever it is that you do. For most of us, Ivy Park came down the lane like a fast break we didn’t see coming. And while Ivy Park continues its success with its spring/summer ’17 collection, which stars Yara Shahidi, the Elle cover, which ranks alongside Tyra Banks’ 1997 Sports Illustrated swimsuit edition and Naomi Campbell’s 1998 Vogue Italia, will live on as one of the most meaningful covers in fashion history. Elle’s May 2017 cover features Angolan model Maria Borges. Borges, 24, ripped the runway in 2015 with her baby ’fro at Victoria’s Secret Fashion Show.